This guide will focus around SEO (Search Engine Optimisation) using the premium WordPress framework Genesis as we use Genesis when building all our WordPress websites. 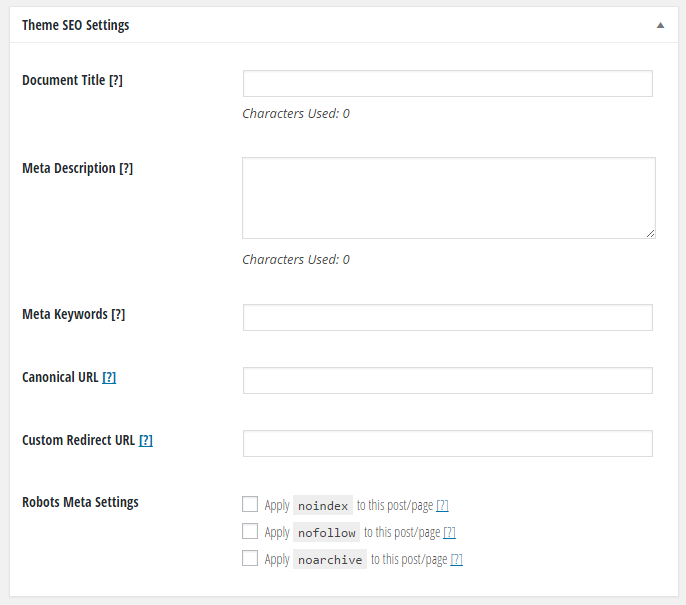 If you don’t see an SEO Settings sub menu, then you probably have another SEO plugin active – Genesis cleverly hides its own excellent inbuilt SEO if this is the case. This guide is not an introduction to SEO – if you are looking for general information on SEO then I’d recommend you first read our beginners guide to SEO – or any of the other SEO topics covered in the resources section of our website. Firstly you find this section on the left hand side of your WordPress admin navigation, under ‘Genesis’. General settings you can edit to determine how the page title is displayed across your website. Document Title – the page title and one of the most important elements on your website for SEO. Document Title Separator – the character that goes between the site title and appended text (often a dash or dot). Document Title Order – determines which side of the title to add the previous 2 items if used. We would always recommend that you select ‘additions to the right’ as that way your actual page title goes first and will have more impact on your SEO. The settings in this section will not be used if a static page is set as the front page. If you’re using a static WordPress page as your homepage, you’ll need to set the SEO settings on that particular page (read on to find out more about this!). You can also specify if the Site Title, Description, or your own custom text should be wrapped in an H1 tag (your main page heading). To add custom text you’ll have to either edit a php file, or use a text widget on a widget enabled homepage. The Document Title sets what will appear within the tags (unseen in the browser) for the home page, optionally append the site description to your homepage title. This is one of the more important elements of your website for SEO. Add Site Description – this optionally inserts your website description (from your General Settings) after the title on your home page. The Meta Description is the short text that appears in search engine results, not really used for SEO but can improve click through rate so worth completing. Most search engines do not use META Keywords at this time or give them very little consideration; however, it’s worth using in case keywords are given greater consideration in the future. If the content doesn’t match with your targeted key words, then you may need to consider your content more carefully. Robots Meta Tags tell search engines how to handle the homepage. Noindex means not to index the page at all, and it will not appear in search results. Nofollow means do not follow any any links from this page and noarchive tells them not to make an archive copy of the page. As you are here you are probably looking to improve your WordPress website SEO – in which case untick all of these boxes! The Relationship Link Tags are tags added by WordPress that currently have no SEO value, but slow your site load down. They’re disabled by default, but if you have a specific need — for a plugin or other non typical use — then you can enable as needed here. You can also add support for Windows Live Writer if you use software that supports this and include a shortlink tag if this is required by any third party service. By default these are all unticked and should be left so unless you have specific need for the functionality. Noarchive and noindex are as explained above in the home settings. Here you can select what other parts of the site to apply these options to. At least one archive should be indexed, but indexing multiple archives will typically result in a duplicate content penalization (multiple pages with identical content look manipulative to search engines). For most sites either the home page or blog page (using the blog template) will serve as this index which is why the default is not to index categories, tags, authors, dates, or searches. We set this up for you at the start and most sites won’t need to change these. Whilst you are looking at this section it is worth checking that you are properly optimising your page URLs. Found underneath the page heading at the top of your edit post / page screen. This is generally not something you want to change after posts / pages have gone live, but it is worth bearing in mind when creating new posts / pages. If people have already linked to it, try to not change the permalink anymore and if you do, make sure the post is properly redirected – ideally adding a 301 redirect into your .htaccess file (this requires FTP access), or you can use a plugin to achieve this such as ‘simple 301 redirects’. In the example above you can see that as I created this post it automatically added all the information into the page permalink, this may work for some posts, but often can create a long unwieldy link with stopwords (like a, an, and, the). If you look at the URL of this page you’ll see that before setting it live we changed the URL to wordpress-seo-beginners which is much more concise and usable. One of the factors Google has been using for some time now in it’s rankings is website speed – it’s no surprise as a slow loading website can often have customers clicking away, and Google wants to provide you with useful links relevant to what you’ve been searching for – this is how they keep customers coming back to use them instead of other search engines! This is another good reason why we develop using Genesis – it allows us to create cleanly coded WordPress websites which load quickly! WordPress gives you great flexibility with its wide range of plugins, however these come at a cost to your website speed and usability. We keep plugin use at a minimum wherever possible, if one is required then we work to ensure that it will not come at the price of a drop in usability and speed. Large images can also slow down your website – we always optimise images for web use for all websites we create, there are various tools you can use to do this for you if you don’t have suitable software. If you edit images regularly then I’d recommend investing in software like Photoshop Elements which is an excellent piece of software at a reasonable price for its functionality (we also have a guide to optimising images using this tool). If all else fails then use one of the automatically generated smaller images that WordPress create for you (when you click ‘add media’ you can select the size of image to insert under ‘ATTACHMENT DISPLAY SETTINGS’ on the right). With the rise in mobile use, Google now factors in whether your website is mobile compatible – you may find that searches made on mobile devices show different results to those made on a computer thanks to this. We create all WordPress websites as responsive sites to ensure that your website ranks well, no matter what device your customer is viewing on.